The joint and several Answer of Samuel Langley and others, to the Appeal of Valentine Quin Esquire and others, was brought in. Hodie 3a vice lecta est Billa, intituled, "An Act for making Divisions, Enclosures, and Allotments, of the Open Corn Fields, and Common Pasture, in the Lordship of Bewholm, otherwise Bewham, in the Parish of Nunkeeling, in the County of York; and for settling and establishing the Payment of a Yearly Sum to the Impropriators of the Rectory of Nunkeeling aforesaid, and their Heirs, in Lieu of Tithes arising within the said Lordship, pursuant to Agreement between the said Impropriators and the Proprietors of the said Lands." Hodie 2a vice lecta est Billa, intituled, "An Act for the better preventing Frauds and Abuses in Gold and Silver Wares." 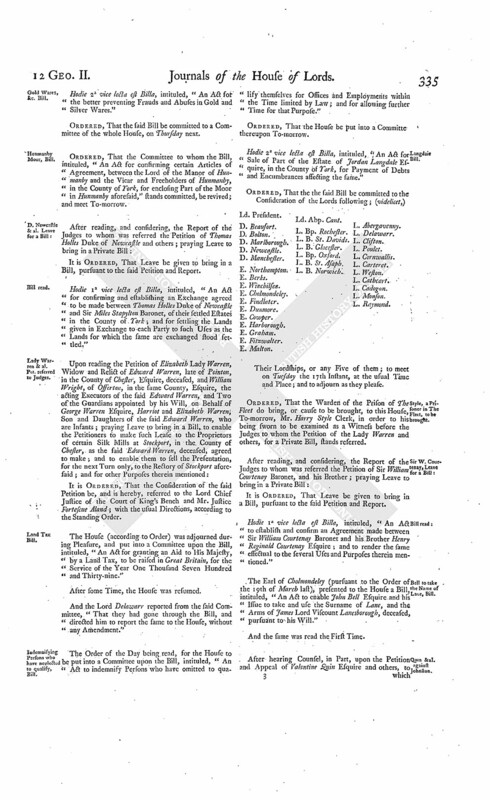 Ordered, That the Committee to whom the Bill, intituled, "An Act for confirming certain Articles of Agreement, between the Lord of the Manor of Hunmanby and the Vicar and Freeholders of Hunmanby, in the County of York, for enclosing Part of the Moor in Hunmanby aforesaid," stands committed, be revived; and meet To-morrow. Hodie 1a vice lecta est Billa, intituled, "An Act for confirming and establishing an Exchange agreed to be made between Thomas Holles Duke of Newcastle and Sir Miles Stapylton Baronet, of their settled Estates in the County of York; and for settling the Lands given in Exchange to each Party to such Uses as the Lands for which the same are exchanged stood settled." Lady Warren & al. Pet. referred to Judges. It is Ordered, That the Consideration of the said Petition be, and is hereby, referred to the Lord Chief Justice of the Court of King's Bench and Mr. Justice Fortescue Aland; with the usual Directions, according to the Standing Order. The House (according to Order) was adjourned during Pleasure, and put into a Committee upon the Bill, intituled, "An Act for granting an Aid to His Majesty, by a Land Tax, to be raised in Great Britain, for the Service of the Year One Thousand Seven Hundred and Thirty-nine." Indemnifying Persons who have neglected to qualify, Bill. The Order of the Day being read, for the House to be put into a Committee upon the Bill, intituled, "An Act to indemnify Persons who have omitted to qualify themselves for Offices and Employments within the Time limited by Law; and for allowing further Time for that Purpose." Ordered, That the House be put into a Committe thereupon To-morrow. Hodie 2a vice lecta est Billa, intituled, "An Act for Sale of Part of the Estate of Jordan Langdale Esquire, in the County of York, for Payment of Debts and Encumbrances affecting the same." E. Malton. Ld. Abp. Cant. L. B. Norwich. L. Abergavenny. Their Lordships, or any Five of them; to meet on Tuesday the 17th Instant, at the usual Time and Place; and to adjourn as they please. Style, a Prisoner in The Fleet, to be brought. Ordered, That the Warden of the Prison of The Fleet do bring, or cause to be brought, to this House, To-morrow, Mr. Harry Style Clerk, in order to his being sworn to be examined as a Witness before the Judges to whom the Petition of the Lady Warren and others, for a Private Bill, stands referred. Hodie 1a vice lecta est Billa, intituled, "An Act to establish and confirm an Agreement made between Sir William Courtenay Baronet and his Brother Henry Reginald Courtenay Esquire; and to render the same effectual to the several Uses and Purposes therein mentioned." Bell to take the Name of Lane, Bill. The Earl of Cholmondeley (pursuant to the Order of the 19th of March last), presented to the House a Bill, intituled, "An Act to enable John Bell Esquire and his Issue to take and use the Surname of Lane, and the Arms of James Lord Viscount Lanesborough, deceased, pursuant to his Will." Dominus Cancellarius declaravit præsens Parliamentum continuandum esse usque ad et in diem Martis, tertium diem instantis Aprilis, hora undecima Auroræ, Dominis sic decernentibus. Roche & al. against Warren. The Answer of Robert Warren Esquire, to the Appeal of John Roche and William Mahony Esquires, was brought in. Butler against Duks & al. As was likewise, the Answer of O'Brien Dilks Esquire and others, to the Appeal of Thomas Butler Esquire and others. Message from H. C. to return Townshend's Bill. To return the Bill, intituled, "An Act for vesting a Messuage and Lands in Twickenham, late the Estate of the Honourable William Townshend Esquire, deceased, in Trustees, in Trust, to sell the same, pursuant to an Article entered into by the said William Townshend in his Life-time; and for applying the Money arising by such Sale for the Benefit of Charles Townshend, his only Son and Heir, an Insant;" and to acquaint this House, that they have agreed to the same, with some Amendments, whereunto they desire their Lordships Concurrence. The Earl of Warwick reported from the Lords Committees to whom the Bill, intituled, "An Act for vesting the settled Estate of Stamp Brooksbank Esquire, in the Counties of Suffolk and Cambridge, in him and his Heirs; and for settling the Manor of Helaugh, and divers Lands and Hereditaments in Helaugh, in the County of the City of York, of greater Value, in Lieu thereof," was committed: "That they had considered the said Bill, and examined the Allegations thereof, which were found to be true; that the Parties concerned had given their Consents; and that the Committee had gone through the Bill, and made some Amendments thereunto." The Earl of Malton reported from the Lords Committees to whom the Bill, intituled, "An Act for confirming certain Articles of Agreement, between the Lord of the Manor of Hunmanby, and the Vicar and Freeholders of Hunmanby, in the County of York, for enclosing Part of the Moor in Hunmanby aforesaid," was committed: "That they had considered the said Bill, and examined the Allegations thereof, which were found to be true; that the Parties concerned had given their Consents; and that the Committee had gone through the Bill, and directed him to report the same to the House, without any Amendment." 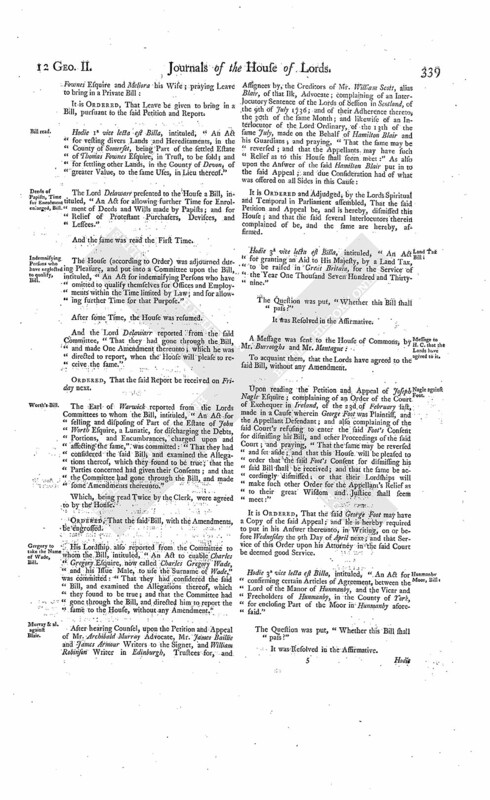 It is Ordered and Adjudged, by the Lords Spiritual and Temporal in Parliament assembled, That in that Part of the said Decree relating to an Account between the Plaintiff and Defendants, upon the Bond in the Pleadings mentioned, this Addition be made, after the Words ["in Discharge of the said Bond"], (videlicet), "And in case the Principal and Interest on the said Bond shall be fully satisfied by such Application of the Rents of the Lands in the Lease made to Henry Widenham, in the Pleadings mentioned, as aforesaid; then the Appellants are to deliver up the said Bond to the Respondent, to be canceled; and if any Overplus of the said Rents shall remain due to the Respondent, after Satisfaction of the said Principal and Interest, the same is to be paid by the Appellants to the Respondent, (that is to say,) as to such Part of such Overplus as accrued since the Death of Henry Widenham by the Appellants Personally, and as to such Part thereof as accrued due from Henry Widenham in his Life-time out of the Assets of the said Henry Widenham; and if the Appellants shall not admit Assets, an Account of Assets is to be taken: But in case any Thing shall remain due to the Appellants for Principal and Interest on the Bond, after Application of the said Rents towards Satisfaction thereof as aforesaid; then, upon Payment thereof, by the Respondent to the Appellants, at such Time and Place as the Master shall appoint, the said Bond is to be delivered to the Respondent, to be canceled; but, in Default of Payment, the Injunction is to be dissolved, and the Bill dismissed with Costs, so far as it seeks Relief against the said Bond:" And it is further Ordered and Adjudged, That, instead of the Word ["Accompt"], mentioned in the said Decree, on which all just Allowances are to be given, the Word ["Accompts"] be inserted; and, after the Word ["given"], these Words be inserted, ["and if any Thing shall be found due to the Respondent on the Accompt last mentioned, the same is to be paid to him by the Appellant Quin"]: And it is hereby further Ordered and Adjudged, That, in that Part of the said Decree whereby an Injunction is awarded, to put the Plaintiff into, and from Time to Time to quiet her in the Possession of, the Lands, the Words ["and from Time to Time to quiet her in the"], be left out; and, after ["Lands"], these Words ["of Ballyroone"] be there inserted; and after the Words ["during the Lease in the Pleadings mentioned, made to Robert Cox"], the Words ["but subject to a Lease made of the Lands of Ballynoe to John Morgan, in the Pleadings also mentioned, if the same be not expired; and, if the said Lease be expired, that the said Injunction be, and is hereby, awarded, to put the Plaintiff in the actual Possession of the said Lands"], be left out; and, instead thereof, these Words be inserted, ["And as to the Lands called Ballynoe, it is hereby declared, That the Plaintiff in the said Court of Chancery, or those who should legally represent the said Robert Cox, were at Liberty to apply to the said Court, under the said Decree, for an Injunction, to put her or them into Possession of those Lands, after the Expiration of the Lease thereof made to John Morgan"]: And it is further Ordered and Adjudged, That, in the said Order of the 17th of June 1737, these Words ["and from Time to Time to quiet him in the actual quiet and peaceable"] be left out: And it is further Ordered and Adjudged, That the Order of the said Court, of the 21st of April 1738, relating to the Taxation of Costs in the said Cause, be, and the same is hereby, reversed; and that the Consideration of Costs, except such as are hereby before directed, be reserved till after the Master shall have made his Report; and that the said Decree and Order of the 17th of June 1737, with these Variations and Additions, be, and are hereby, affirmed: And it is also Ordered and Adjudged, That the said Order of the 10th of June 1737, for reviving the Cause as against the Appellants, be, and is hereby, likewise affirmed: And it is hereby further Ordered, That the Court of Chancery of Ireland do give all such Directions, for the better taking and clearing the said Accompts by the said Decree and hereby directed to be taken, and also for carrying this Judgement into Execution, as shall be proper and just. Hodie 2a vice lecta est Billa, intituled, "An Act for confirming an Exchange agreed to be made between Thomas Holles Duke of Newcastle and Sir Miles Stapylton Baronet, of their settled Estates in the County of York; and for settling the Lands given in Exchange to each Party to such Uses as the Lands for which the same are exchanged stood settled." V. Townshend. L. Bp. Rochester. Their Lordships, or any Five of them; to meet on Wednesday the 18th Instant, at the usual Time and Place; and to adjourn as they please. Hodie 2a vice lecta est Billa, intituled, "An Act for dividing and enclosing the Common Fields lying in the Manor of Shipton Moyne, within the Parish of Shipton Moyne and Dovel, in the County of Glocester, commonly called The North and South Common Fields." Hodie 2a vice lecta est Billa, intituled, "An Act to establish and confirm an Agreement made between Sir William Courtenay Baronet and his Brother Henry Reginald Courtenay Esquire; and to render the same effectual to the several Uses and Purposes therein mentioned." Hodie 2a vice lecta est Billa, intituled, "An Act to enable John Bell Esquire and his Issue to take and use the Surname of Lane, and the Arms of James Lord Viscount Lanesborough, deceased, pursuant to his Will." The House being moved, "That a Day may be appointed, for hearing the Cause wherein John Roche and William Mahony Esquires are Appellants, and Robert Warren Esquire is Respondent:"
Dominus Cancellarius declaravit præsens Parliamentum continuandum esse usque ad et in diem Mercurii, quartum diem instantis Aprilis, hora undecima Auroræ, Dominis sic decernentibus. Manufacturers of Gold and Silver to be heard. 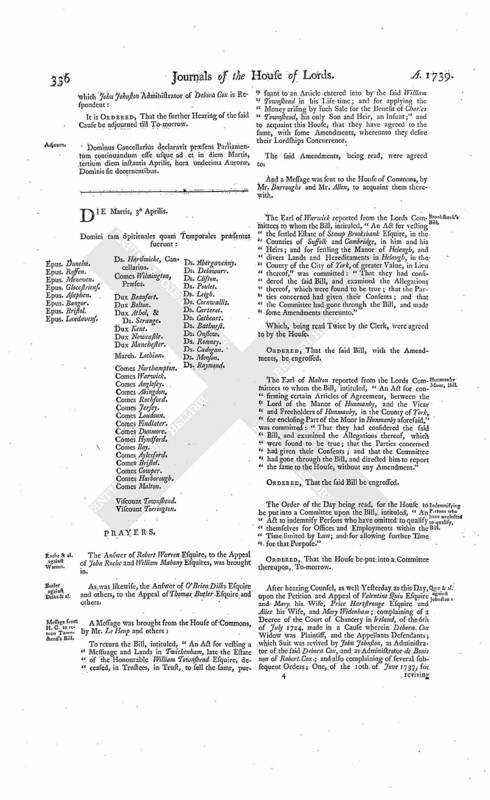 Upon reading the Petition of the several Dealers, Workers, and Makers of Manufactures in Gold and Silver; praying, "That they may be heard, by their Counsel, against such of the Clauses in the Bill depending in this House, for the better preventing Frauds and Abuses in Gold and Silver Wares, as they conceive will affect the Petitioners:"
It is Ordered, That the said Petition be referred to the Committee of the whole House to whom the said Bill stands committed; and that the Petitioners may be heard, as desired, before the said Committee; as may Counsel for the Bill at the same Time; and that the Meeting of the Committee To-morrow be put off to Tuesday Sevennight. With a Bill, intituled, "An Act to enable the (fn. 1) Parishioners of the Parish of Ealing, in the County of Middlesex, to raise Money, by Rates upon themselves, for finishing the Church of the said Parish;" to which they desire the Concurrence of this House. Hodie 1a vice lecta est Billa, intituled, "An Act for vesting divers Lands and Hereditaments, in the County of Somerset, being Part of the settled Estate of Thomas Fownes Esquire, in Trust, to be sold; and for settling other Lands, in the County of Devon, of greater Value, to the same Uses, in Lieu thereof." Deeds of Papists, Time for Enrolment enlarged, Bill. The Lord Delawarr presented to the House a Bill, intituled, "An Act for allowing further Time for Enrolment of Deeds and Wills made by Papists; and for Relief of Protestant Purchasers, Devisees, and Lessees." 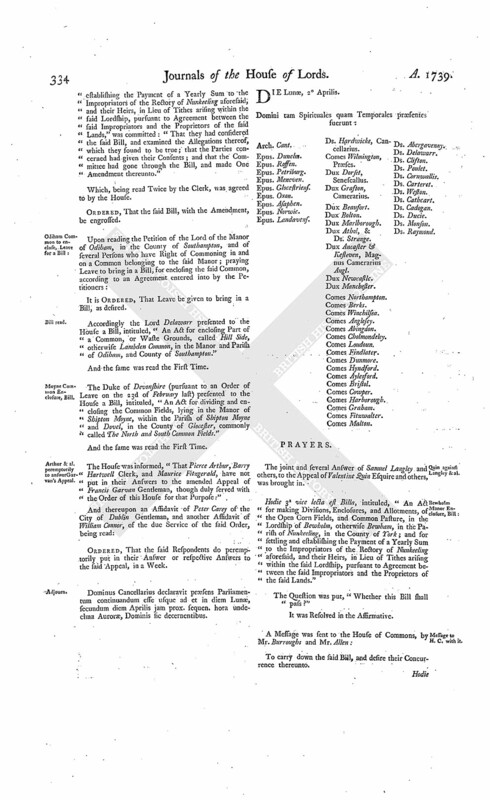 The House (according to Order) was adjourned during Pleasure, and put into a Committee upon the Bill, intituled, "An Act for indemnifying Persons who have omitted to qualify themselves for Offices and Employments within the Time limited by Law; and for allowing further Time for that Purpose." And the Lord Delawarr reported from the said Committee, "That they had gone through the Bill, and made One Amendment thereunto; which he was directed to report, when the House will please to receive the same." Ordered, That the said Report be received on Friday next. The Earl of Warwick reported from the Lords Committees to whom the Bill, intituled, "An Act for selling and disposing of Part of the Estate of John Worth Esquire, a Lunatic, for discharging the Debts, Portions, and Encumbrances, charged upon and affecting the same," was committed: "That they had considered the said Bill, and examined the Allegations thereof, which they found to be true; that the Parties concerned had given their Consents; and that the Committee had gone through the Bill, and made some Amendments thereunto." Gregory to take the Name of Wade, Bill. His Lordship also reported from the Committee to whom the Bill, intituled, "An Act to enable Charles Gregory Esquire, now called Charles Gregory Wade, and his Issue Male, to use the Surname of Wade," was committed: "That they had considered the said Bill, and examined the Allegations thereof, which they found to be true; and that the Committee had gone through the Bill, and directed him to report the same to the House, without any Amendment." Murray & al. against Blair. It is Ordered and Adjudged, by the Lords Spiritual and Temporal in Parliament assembled, That the said Petition and Appeal be, and is hereby, dismissed this House; and that the said several Interlocutors therein complained of be, and the same are hereby, affirmed. Hodie 3a vice lecta est Billa, intituled, "An Act for granting an Aid to His Majesty, by a Land Tax, to be raised in Great Britain, for the Service of the Year One Thousand Seven Hundred and Thirtynine." Upon reading the Petition and Appeal of Joseph Nagle Esquire; complaining of an Order of the Court of Exchequer in Ireland, of the 23d of February last, made in a Cause wherein George Foot was Plaintiff, and the Appellant Defendant; and also complaining of the said Court's refusing to enter the said Foot's Consent for dismissing his Bill, and other Proceedings of the said Court; and praying, "That the same may be reversed and set aside; and that this House will be pleased to order that the said Foot's Consent for dismissing his said Bill shall be received; and that the same be accordingly dismissed; or that their Lordships will make such other Order for the Appellant's Relief as to their great Wisdom and Justice shall seem meet:"
It is Ordered, That the said George Foot may have a Copy of the said Appeal; and he is hereby required to put in his Answer thereunto, in Writing, on or before Wednesday the 9th Day of April next; and that Service of this Order upon his Attorney in the said Court be deemed good Service. Hodie 3a vice lecta est Billa, intituled, "An Act for confirming certain Articles of Agreement, between the Lord of the Manor of Hunmanby, and the Vicar and Freeholders of Hunmanby, in the County of York, for enclosing Part of the Moor in Hunmanby aforesaid." Hodie 3a vice lecta est Billa, intituled, "An Act for vesting the settled Estate of Stamp Brooksbank Esquire, in the Counties of Suffolk and Cambridge, in him and his Heirs; and for settling the Manor of Helaugh, and divers Lands and Hereditaments, in Helaugh, in the County of the City of York, of greater Value, in Lieu thereof. Message from H. C. with the Two preceding Bills. To carry down the said Two Bills, and desire their Concurrence thereunto. Dominus Cancellarius declaravit præsens Parliamentum continuandum esse usque ad et in diem Veneris, sextum diem instantis Aprilis, hora undecima Auroræ, Dominis sic decernentibus. The Answer of Charles Lyons Merchant, Administrator of the Goods and Chatels, Rights and Credits, of Philip Sullivan, deceased, to the Appeal of Edward Edgworth Esquire, was brought in. Dr. Madden's Pet. to lie on the Table. Upon reading the Petition of the Reverend Doctor John Madden, Dean of Kilmore in the Kingdom of Ireland, and others; praying, "In regard One of his Counsel, His Majesty's Attorney General, is taken very ill; that the Hearing of the Appeal of the Earl of Westmeath, to which the Petitioner is Respondent, may be put off to such short Day as to the House shall seem meet:"
Then a Petition of Robert Jocelyn Esquire, His Majesty's Attorney General of Ireland, Respondent to the Appeal of Robert Dillon and others, was also presented, and read; setting forth, "That the Petitioner, immediately after his having Notice of the said Appeal being lodged, got his Papers compared by a proper Person, in order to their being transmitted, and delivered upon Oath, at the Bar of this House, in the usual Form; and though the Person who compared the Papers was ready to come away with them the Second of last Month, yet he has been detained in Ireland ever since by contrary Winds; but the Petitioner is now daily in Expectation of his Arrival;" and praying, "That the Hearing of this Cause, which stands for this Day Sevennight, may be adjourned to such Bye-day as to the House shall seem meet." Ordered, That the Hearing of the said Cause be put off to the First Tuesday after the Recess at Easter. E. Westmeath's Appeal put off. Ordered, That the Hearing of the Appeal of the Earl of Westmeath, which stands for Monday next, be put off to this Day Sevennight. To return the Bill, intituled, "An Act for vesting in Archibald Hamilton Esquire, commonly called Lord Archibald Hamilton, and his Heirs, the Lands, Tenements, and Hereditaments, in the County of Berks, therein mentioned, in Trust, to convey the same to Sir William Irby Baronet and his Heirs; and for laying out the Purchase-money in the Purchase of Lands, Tenements, and Hereditaments, to be settled to the Uses and upon the Trusts therein mentioned;" and to acquaint this House, that they have agreed to the same, without any Amendment. Edgworth to inspect Writings, &c.
Upon reading the Petition of Packington Edgworth, Respondent to the Appeal of Robert Edgworth, by his Guardian; setting forth, "That, by Order of this House, of the Second of February last, certain Articles, Settlements, and other Writings, in the Pleadings in the said Cause mentioned, were lodged with the Clerk of this House, till the hearing the Appeal, and their Lordships further Order; and that the Petitioner is advised it will be necessary for him to have Liberty to inspect such Writings, and to take Copies of such of them as he shall be advised;" and praying, "That the Petitioner may be at Liberty to inspect the same, and to take Copies of such of them as he shall be advised:"
It is Ordered, That the Petitioner, or his Agent, be at Liberty to inspect the said Writings so lodged with the said Clerk, in his Presence, upon reasonable Notice to be given to the Agent for the Appellant; and that either Side may take Copies thereof, at their own Expence. The Earl of Findlater reported from the Lords Committees to whom the Bill, intituled, "An Act to enable John Bell Esquire and his Issue to take and use the Surname of Lane, and the Arms of James Lord Viscount Lanesborough, deceased, pursuant to his Will," was committed: "That they had considered the said Bill, and examined the Allegations thereof, which were found to be true; and that the Committee had gone through the Bill, and directed him to report the same to the House, without any Amendment." The House being moved, "That the Standing Order of this House, requiring Fourteen Days Notice to be given of the Meeting of Committees on Private Bills, may be so far dispensed with, as that the Committee to whom the Bill, intituled, "An Act to establish and confirm an Agreement made between Sir William Courtenay Baronet and his Brother Henry Reginald Courtenay Esquire, and to render the same effectual to the several Uses and Purposes therein mentioned," stands committed, may meet on a sooner Day than was at first appointed, in regard this Session of Parliament is pretty far advanced:"
It is Ordered, That the said Motion be taken into Consideration on Monday next; and the Lords to be summoned. Ordered, That the Committee to whom the Bill, intituled, "An Act for enclosing Part of certain Common Fields, in the Township of Pailton, in the County of Warwick," stands committed, be revived; and meet To-morrow. Hodie 3a vice lecta est Billa, intituled, "An Act for selling and disposing of Part of the Estate of John Worth Esquire, a Lunatic, for discharging the Debts, Portions, and Encumbrances, charged upon and affecting the same." Deeds, &c. of Papists, Time for Enrolment of enlarged, Bill. Hodie 2a vice lecta est Billa, intituled, "An Act for vesting divers Lands and Hereditaments, in the County of Somerset, being Part of the settled Estate of Thomas Fownes Esquire, in Trust, to be sold; and for settling other Lands, in the County of Devon, of a greater Value, to the same Uses, in Lieu thereof." V. Harcourt. L. B. St. Davids. Their Lordships, or any Five of them; to meet on Monday the 23d Instant, at the usual Time and Place; and to adjourn as they please. It is Ordered, That the further Hearing of the said Cause be adjourned till Monday next. Dominus Cancellarius declaravit præsens Parliamentum continuandum esse usque ad et in diem Lunæ, nonum diem instantis Aprilis, hora undecima Auroræ, Dominis sic decernentibus. The Lord Delawarr reported from the Committee of the whole House to whom the Bill, intituled, "An Act to indemnify Persons who have omitted to qualify themselves for Offices and Employments, within the Time limited by Law, and for allowing further Time for that Purpose," was committed: "That they had gone through the same, and made One Amendment thereunto." His Lordship also reported from the Lords Committees to whom the Bill, intituled, "An Act for discharging several Lands in Nosely, in the County of Leicester, purchased by the Executors of Philip Earl of Chesterfield, deceased, from the Uses and Limitations contained in the Will of the said Earl; and for vesting the same Lands in Trustees, to be sold; and, with the Money arising thereby, to purchase other Lands to be settled to the same Uses," was committed: "That they had considered the said Bill, and examined the Allegations thereof, which they found to be true; that the Parties concerned had given their Consents; and that the Committee had gone through the Bill, and made some Amendments thereunto." Hodie 1a vice lecta est Billa, intituled, "An Act for discharging Part of the settled Estate of William Earl Cowper, in the County of Hertford, from the Uses and Limitations of a former Settlement; and for settling and securing an Equivalent for the same, to the like Uses." 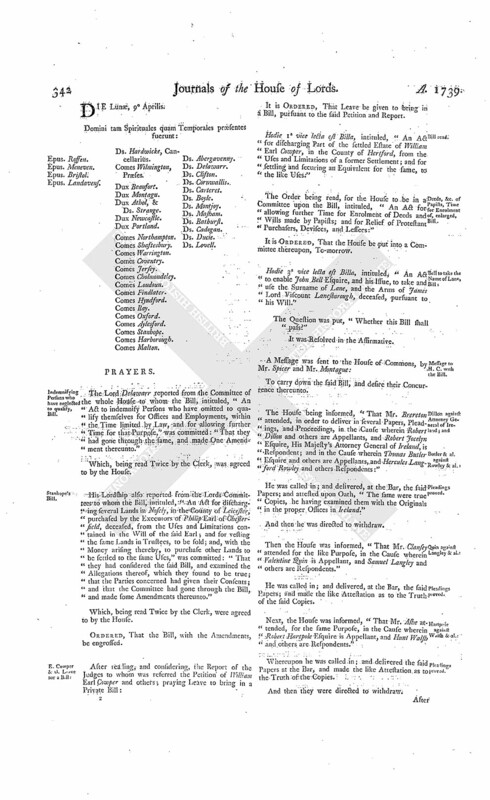 Deeds, &c. of Papists, Time for Enrolment of, enlarged, Bill. 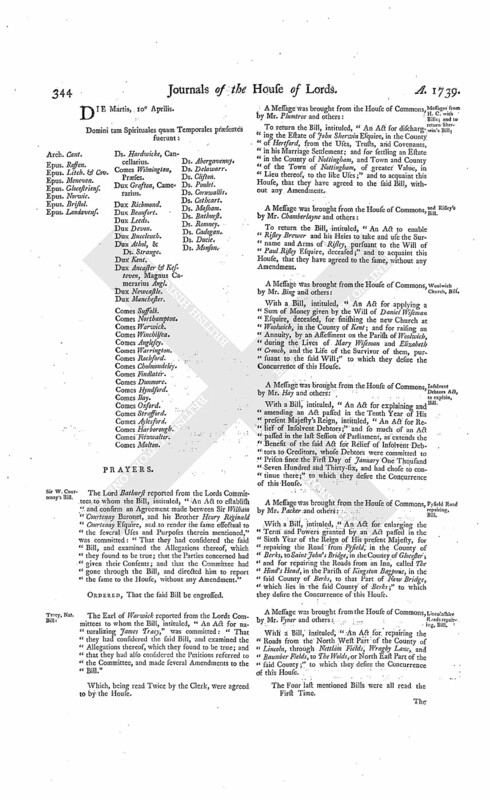 The Order being read, for the House to be in a Committee upon the Bill, intituled, "An Act for allowing further Time for Enrolment of Deeds and Wills made by Papists; and for Relief of Protestant Purchasers, Devisees, and Lessees:"
It is Ordered, That the House be put into a Committee thereupon, To-morrow. Hodie 3a vice lecta est Billa, intituled, "An Act to enable John Bell Esquire, and his Issue, to take and use the Surname of Lane, and the Arms of James Lord Viscount Lanesborough, deceased, pursuant to his Will." Dillon against Attorney General of Ireland; and Butler & al. against Rowley & al. 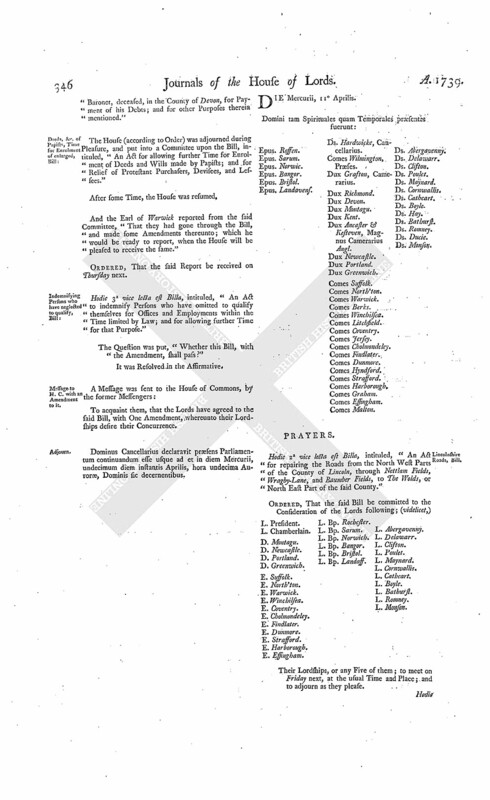 The House being informed, "That Mr. Brereton attended, in order to deliver in several Papers, Pleadings, and Proceedings, in the Cause wherein Robert Dillon and others are Appellants, and Robert Jocelyn Esquire, His Majesty's Attorney General of Ireland, is Respondent; and in the Cause wherein Thomas Butler Esquire and others are Appellants, and Hercules Langford Rowley and others Respondents:"
He was called in; and delivered, at the Bar, the said Papers; and attested upon Oath, "The same were true Copies, he having examined them with the Originals in the proper Offices in Ireland." Then the House was informed, "That Mr. Clansey attended for the like Purpose, in the Cause wherein Valentine Quin is Appellant, and Samuel Langley and others are Respondents." He was called in; and delivered, at the Bar, the said Papers; and made the like Attestation as to the Truth of the said Copies. Next, the House was informed, "That Mr. Ashe attended, for the same Purpose, in the Cause wherein Robert Hartpole Esquire is Appellant, and Hunt Walsh and others are Respondents." Whereupon he was called in; and delivered the said Papers at the Bar, and made the like Attestation as to the Truth of the Copies. Monro against Pelson & al. 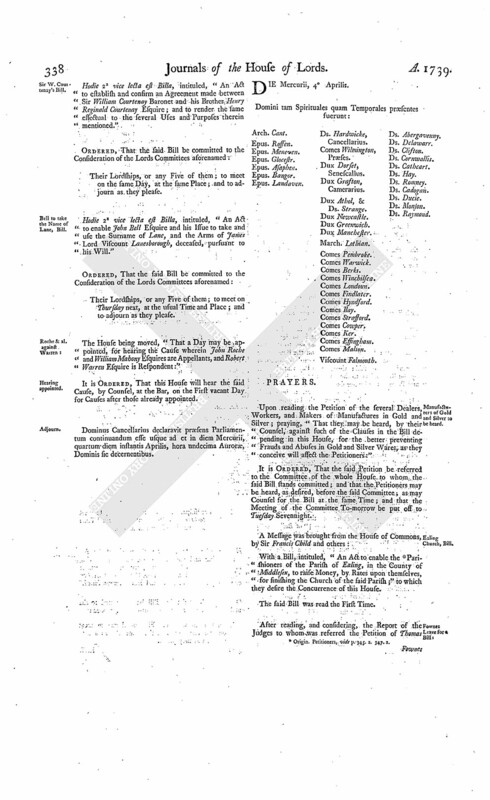 Sir W. Courtenay's Bill; Committee shortened. It is Ordered, That the said Standing Order be so far dispensed with in this Case, as that the Committee may meet To-morrow, on Consideration of the said Bill. Garvan against Damer et al. The House being moved, "That a Day may be appointed, for hearing the Cause wherein Francis Garvan Gentleman is Appellant, and John Damer Esquire and others are Respondents:"
The like Motion and Order, for hearing the Cause wherein Valentine Quin Esquire is Appellant, and Samuel Langley and others are Respondents, on the next vacant Day for Causes after those already appointed. Hodie 2a vice lecta est Billa, intituled, "An Act for enclosing Part of a Common, or Waste Grounds, called Hill Side, otherwise Lambden Common, in the Manor and Parish of Odiham, and County of Southampton." E. Malton. L. Bp. Rochester. Ingoldsby against Naper et al. and Dillon against Attorney General Ireland. 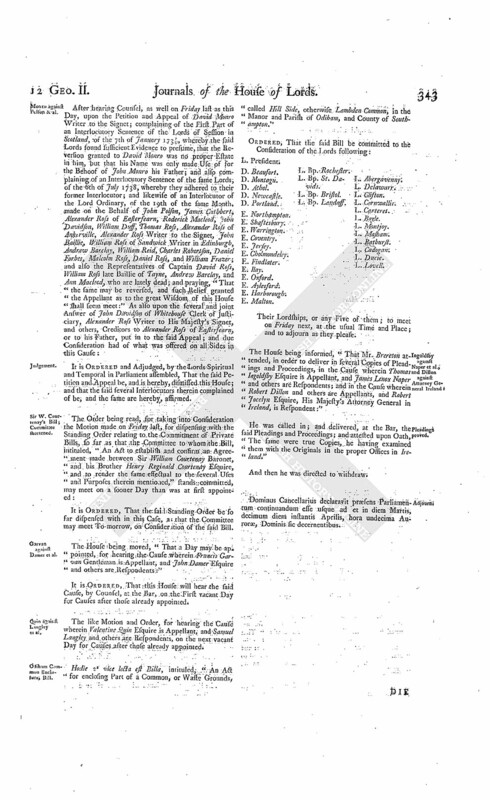 The House being informed, "That Mr. Brereton attended, in order to deliver in several Copies of Pleadings and Proceedings, in the Cause wherein Thomas Ingoldsby Esquire is Appellant, and James Lenox Naper and others are Respondents; and in the Cause wherein Robert Dillon and others are Appellants, and Robert Jocelyn Esquire, His Majesty's Attorney General in Ireland, is Respondent:"
He was called in; and delivered, at the Bar, the said Pleadings and Proceedings; and attested upon Oath, The same were true Copies, he having examined them with the Originals in the proper Offices in Ireland." Dominus Cancellarius declaravit præsens Parliamentum continuandum esse usque ad et in diem Martis, decimum diem instantis Aprilis, hora undecima Auroræ, Dominis sic decernentibus. The Lord Bathurst reported from the Lords Committees to whom the Bill, intituled, "An Act to establish and confirm an Agreement made between Sir William Courtenay Baronet, and his Brother Henry Reginald Courtenay Esquire, and to render the same effectual to the several Uses and Purposes therein mentioned," was committed: "That they had considered the said Bill, and examined the Allegations thereof, which they found to be true; that the Parties concerned had given their Consents; and that the Committee had gone through the Bill, and directed him to report the same to the House, without any Amendment." The Earl of Warwick reported from the Lords Committees to whom the Bill, intituled, "An Act for naturalizing James Tracy," was committed: "That they had considered the said Bill, and examined the Allegations thereof, which they found to be true; and that they had also considered the Petitions referred to the Committee, and made several Amendments to the Bill." To return the Bill, intituled, "An Act for discharging the Estate of John Sherwin Esquire, in the County of Hertford, from the Uses, Trusts, and Covenants, in his Marriage Settlement; and for settling an Estate in the County of Nottingham, and Town and County of the Town of Nottingham, of greater Value, in Lieu thereof, to the like Uses;" and to acquaint this House, that they have agreed to the said Bill, without any Amendment. To return the Bill, intituled, "An Act to enable Risley Brewer and his Heirs to take and use the Surname and Arms of Risley, pursuant to the Will of Paul Risley Esquire, deceased;" and to acquaint this House, that they have agreed to the same, without any Amendment. 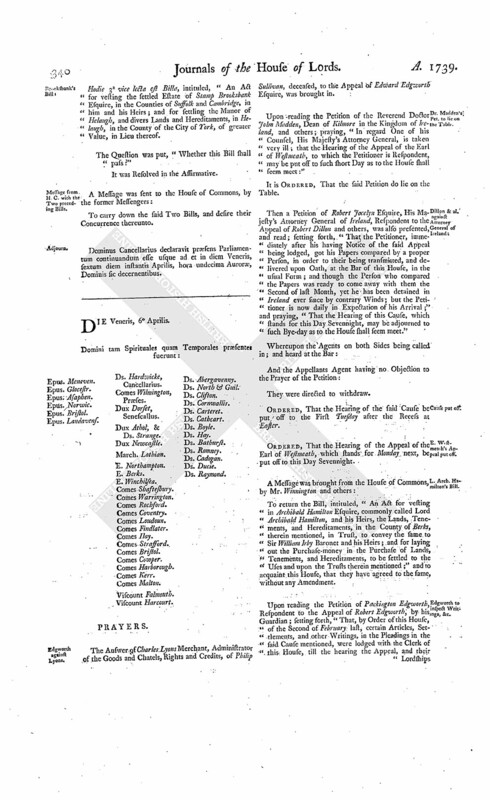 With a Bill, intituled, "An Act for applying a Sum of Money given by the Will of Daniel Wiseman Esquire, deceased, for finishing the new Church at Woolwich, in the County of Kent; and for raising an Annuity, by an Assessment on the Parish of Woolwich, during the Lives of Mary Wiseman and Elizabeth Crouch, and the Life of the Survivor of them, pursuant to the said Will;" to which they desire the Concurrence of this House. Insolvent Debtors Act, to explain, Bill. 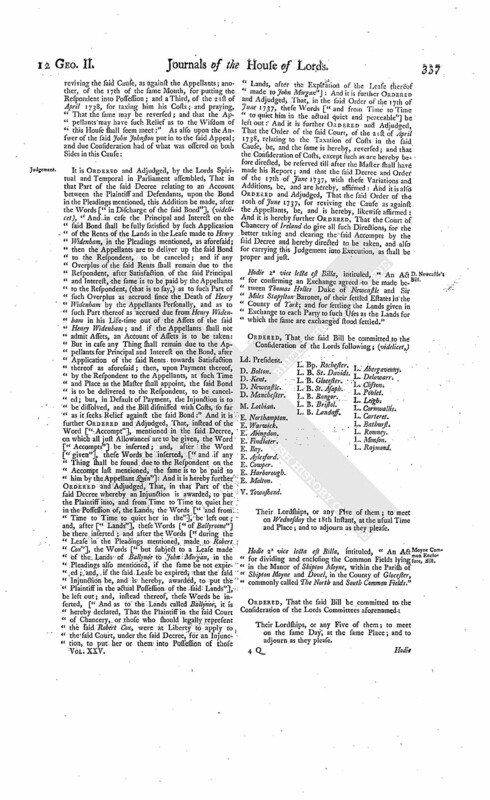 With a Bill, intituled, "An Act for explaining and amending an Act passed in the Tenth Year of His present Majesty's Reign, intituled, "An Act for Relief of Insolvent Debtors;" and so much of an Act passed in the last Session of Parliament, as extends the Benefit of the said Act for Relief of Insolvent Debtors to Creditors, whose Debtors were committed to Prison since the First Day of January One Thousand Seven Hundred and Thirty-six, and had chose to continue there;" to which they desire the Concurrence of this House. 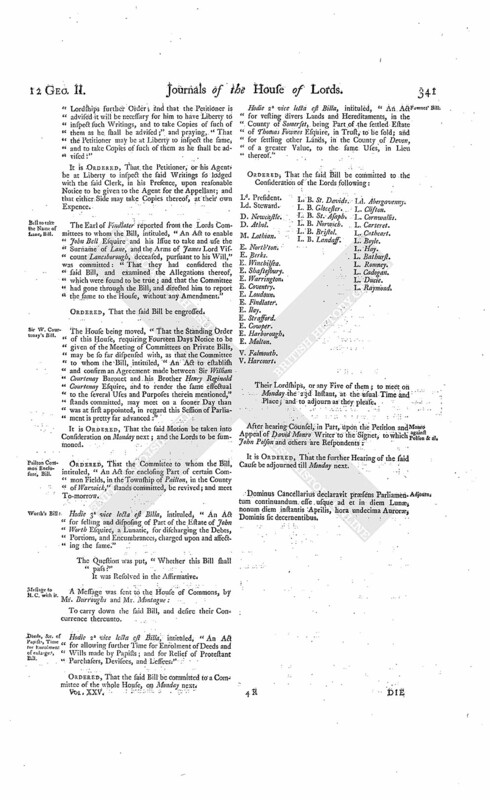 With a Bill, intituled, "An Act for enlarging the Term and Powers granted by an Act passed in the Sixth Year of the Reign of His present Majesty, for repairing the Road from Fyfield, in the County of Berks, to Saint John's Bridge, in the County of Glocester; and for repairing the Roads from an Inn, called The Hind's Head, in the Parish of Kingston Bagpuze, in the said County of Berks, to that Part of New Bridge, which lies in the said County of Berks;" to which they desire the Concurrence of this House. With a Bill, intituled, "An Act for repairing the Roads from the North West Part of the County of Lincoln, through Nettlam Fields, Wragby Lane, and Baumber Fields, to The Wolds, or North East Part of the said County;" to which they desire the Concurrence of this House. The Four last mentioned Bills were all read the First Time. (fn. 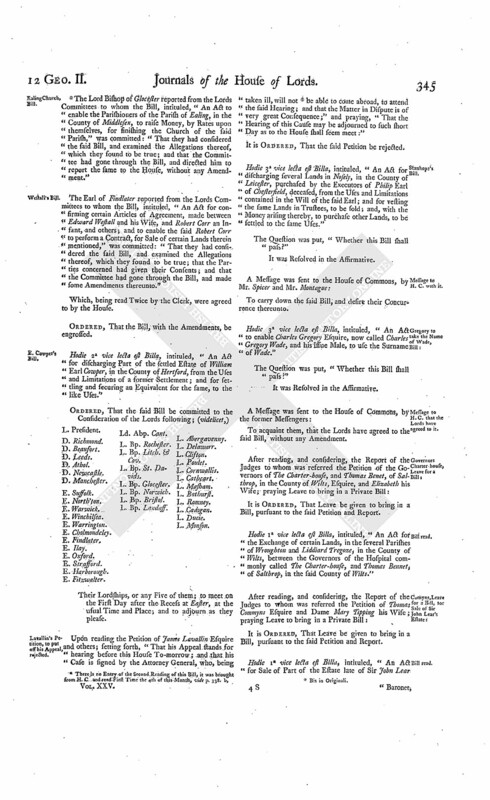 2) The Lord Bishop of Glocester reported from the Lords Committees to whom the Bill, intituled, "An Act to enable the Parishioners of the Parish of Ealing, in the County of Middlesex, to raise Money, by Rates upon themselves, for finishing the Church of the said Parish," was committed: "That they had considered the said Bill, and examined the Allegations thereof, which they found to be true; and that the Committee had gone through the Bill, and directed him to report the same to the House, without any Amendment." The Earl of Findlater reported from the Lords Committees to whom the Bill, intituled, "An Act for consirming certain Articles of Agreement, made between Edward Westall and his Wife, and Robert Corr an Infant, and others; and to enable the said Robert Corr to perform a Contract, for Sale of certain Lands therein mentioned," was committed: "That they had considered the said Bill, and examined the Allegations thereof, which they found to be true; that the Parties concerned had given their Consents; and that the Committee had gone through the Bill, and made some Amendments thereunto." Hodie 2a vice lecta est Billa, intituled, "An Act for discharging Part of the settled Estate of William Earl Cowper, in the County of Hertford, from the Uses and Limitations of a former Settlement; and for settling and securing an Equivalent for the same, to the like Uses." Lavallin's Petition, to put off his Appeal, rejected. Upon reading the Petition of James Lavallin Esquire and others; setting forth, "That his Appeal stands for hearing before this House To-morrow; and that his Case is signed by the Attorney General, who, being taken ill, will not (fn. 3) be able to come abroad, to attend the said Hearing; and that the Matter in Dispute is of very great Consequence;" and praying, "That the Hearing of this Cause may be adjourned to such short Day as to the House shall seem meet:"
Hodie 3a vice lecta est Billa, intituled, "An Act for discharging several Lands in Nosely, in the County of Leicester, purchased by the Executors of Philip Earl of Chesterfield, deceased, from the Uses and Limitations contained in the Will of the said Earl; and for vesting the same Lands in Trustees, to be sold; and, with the Money arising thereby, to purchase other Lands, to be settled to the same Uses." Hodie 3a vice lecta est Billa, intituled, "An Act to enable Charles Gregory Esquire, now called Charles Gregory Wade, and his Issue Male, to use the Surname of Wade." Hodie 1a vice lecta est Billa, intituled, "An Act for the Exchange of certain Lands, in the several Parishes of Wroughton and Liddiard Tregoze, in the County of Wilts, between the Governors of the Hospital commonly called The Charter-house, and Thomas Bennet, of Salthrop, in the said County of Wilts." Hodie 1a vice lecta est Billa, intituled, "An Act for Sale of Part of the Estate late of Sir John Lear Baronet, deceased, in the County of Devon, for Payment of his Debts; and for other Purposes therein mentioned." And the Earl of Warwick reported from the said Committee, "That they had gone through the Bill, and made some Amendments thereunto; which he would be ready to report, when the House will be pleased to receive the same." Ordered, That the said Report be received on Thursday next. Hodie 3a vice lecta est Billa, intituled, "An Act to indemnify Persons who have omitted to qualify themselves for Offices and Employments within the Time limited by Law; and for allowing further Time for that Purpose." Message to H. C. with an Amendment to it. Dominus Cancellarius declaravit præsens Parliamentum continuandum esse usque ad et in diem Mercurii, undecimum diem instantis Aprilis, hora undecima Auroræ, Dominis sic decernentibus. 1. Origin. Petitioners, vide p. 345. a. 347. a.